Pacific Reglazing provides high quality, affordable kitchen and bathroom repair and refinishing services throughout the Greater Los Angeles area, the San Fernando Valley, Ventura, Orange County and Riverside County. "These guys are great! Reglazed our old bathtub and now it looks like new. 4 years later and it is holding up great. These guys are miracle workers." C.C. "The technician was very professional and very pleasant. He did a remarkable job. My kitchen sinks and bathtub look brand new! Thank you for everything." D.F. "I have been in the hotel, motel and apartment management business for more than 25 years and not until now was I even aware it was possible to repair and refinish a kitchen or bathroom countertop, or just change the color of outdated appliances in the way Pacific Reglazing does. I was very impressed with their professionalism and fast turn around. 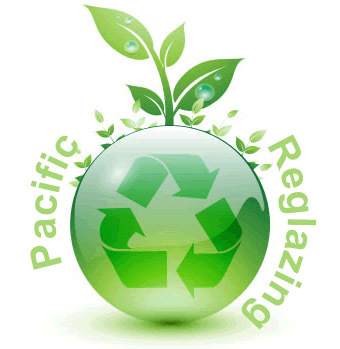 We are going to be using a lot of Pacific Reglazing in the near future." J.K.
Pacific Reglazing was recommended by HGTV Designer Kenneth Brown. Quality and value! We use the most effective and durable surface refinishing materials available that have been proven through years of experience. Beware of cheaper, inferior or experimental materials in use by other refinishers that may easily chip, peel or yellow with age. These are common flaws of inferior materials. You save a lot more money by doing it right from the start than having to do it over later. Licensed and Fully Insured. Contractors who are not insured are a great liability. If they hurt themselves on the job they can sue the property owner! Be aware that small operators often undercut competitor prices by cutting corners and since insurance is very expensive they usually choose to go without proper insurance coverage. We carry $1,000,000 in liability insurance as well as full Workers Compensation coverage which covers any on the job injury. Use only licensed and insured contractors. It is easy to check. See the blue box above. Surface Refinishing is a GREEN solution. When you refinish a kitchen or bathroom fixture, you help save Earth resources and reduce the burden on local land fills.